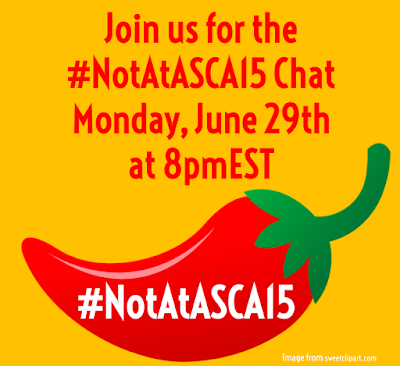 On Monday, June 29th at 8pmEST Dr. Erin Mason (@ecmmason) and I @sch_counselor) moderated the #NotAtASCA15 chat. We chatted about what we learned from following #ASCA15 online, what we missed about being able to attend an ASCA conference in person, and what it is like to follow the conference while #NotAtASCA15. 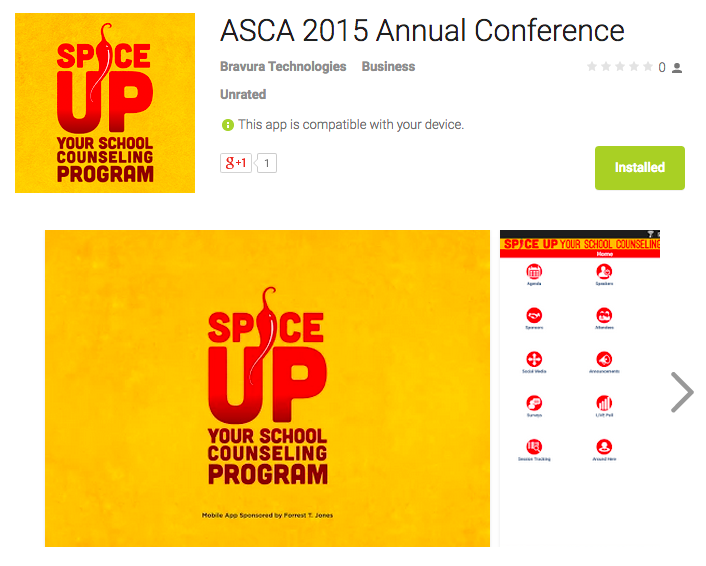 Many school counselors shared they are hoping to attend #ASCA16 in New Orleans, LA. The dates for the 2016 ASCA Conference are July 9th through July 11th. Mark your calendar! 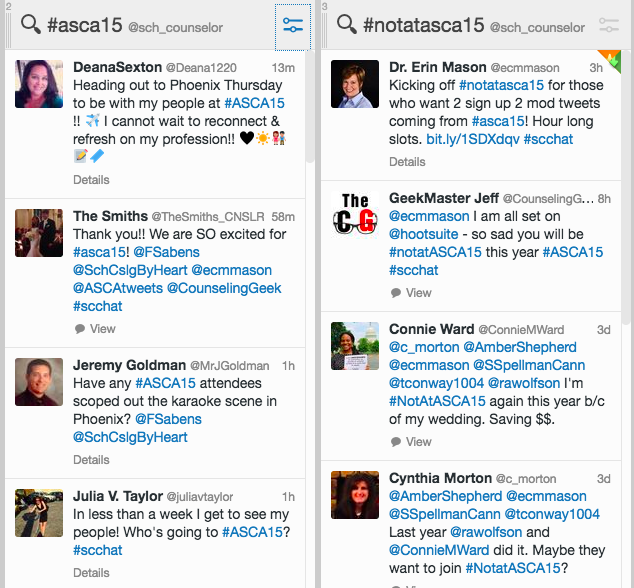 You can view the #NotAtASCA15 chat transcript below or view the full transcript here. Did you enjoy connecting with other school counselors via Twitter? 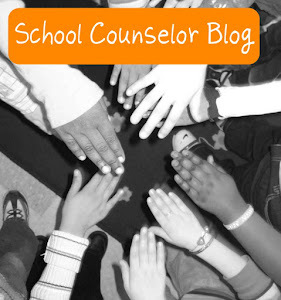 Join School Counselor Blog and SCOP for our monthly #SCCHAT! #SCCHAT takes place the first Tuesday of the month @ 8pmEST! Visit #SCCHAT Info: http://bit.ly/scchat-info for transcripts of previous #SCCHATs, schedules for future School Counselor Tweet Chats, and information on how to participate. On Monday, June 29th at 8pmEST Dr. Erin Mason (@ecmmason) and I (@sch_counselor) will be moderating the #NotAtASCA15 chat. 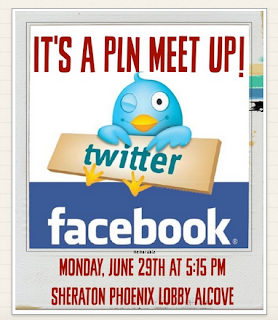 This chat is open for anyone interested in chatting about the #ASCA15 conference. While our school counselor colleagues are meeting up at #ASCA15 in person, we will be chatting online about resources and information we learned about by following the along online. We will create a transcript after the #NotAtASCA15 chat so you can access all the links and information that we share during the chat. Last year the #NotAtASCA14 chat was moderated by Connie Ward (@ConnieMWard). You can view a transcript of the #NotAtASCA14 chat. There are lots of great links and resources shared during the #NotAtASCA14 chat! For more information about participating in a School Counselor Twitter chat, visit http://bit.ly/scchat-info. 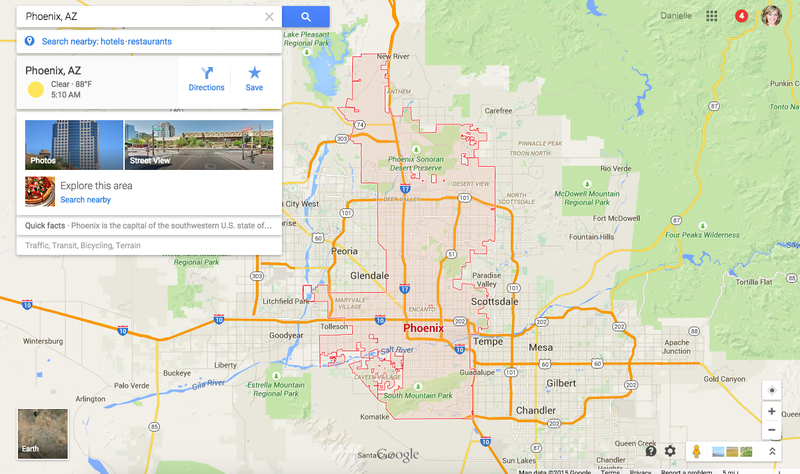 Wish you were headed to the 2015 ASCA National Conference in Phoenix, AZ, but can't make it this year? This post is for you! This will be my first time virtually following the ASCA National Conference from home. As I mentioned in my previous post, I have attended the past four ASCA Conferences and will not be attending this year because we are awaiting the arrival of our first child in July! Below I will share some tips for following along with all the #ASCA15 buzz while at home or from your vacation destination! I really wish Dr. Erin Mason and I would have recorded our rendition of Justin Timberlake and Jimmy Fallon's #Hashtag Sketch that we did during our presentation at the ASCA Conference last year. A hashtag is a basically a way to label a term so that it is searchable. 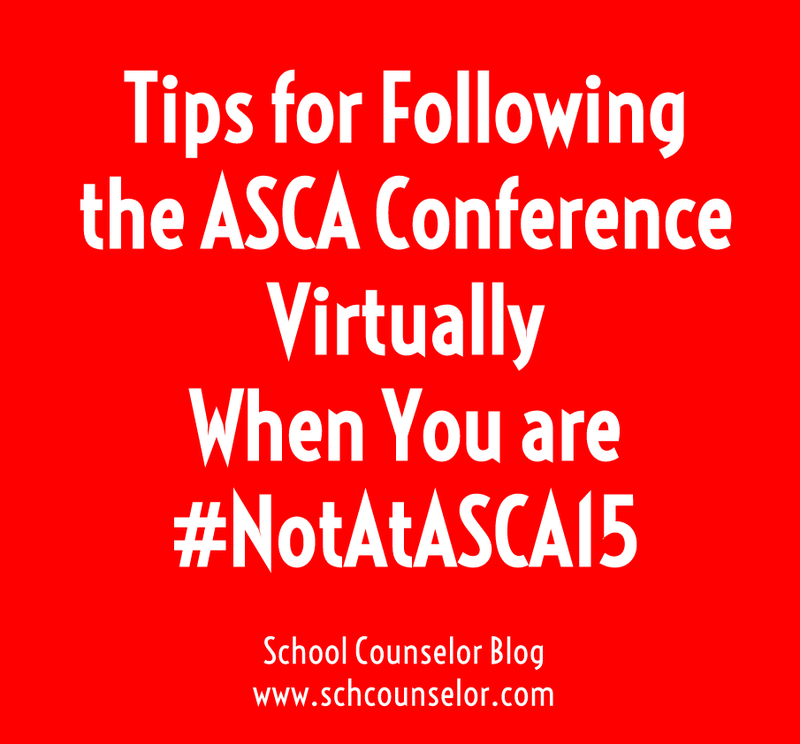 For the ASCA Conference this year, the hashtag is #ASCA15. 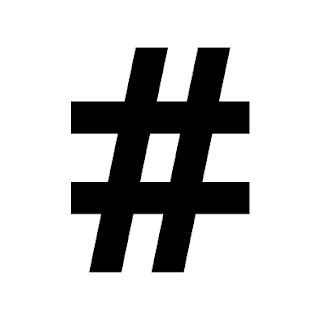 If you do a search on social media sites for this hashtag, you will find all the messages that use this tag. Some people who were not able to attend the ASCA Conference a few years ago started labeling their social media posts with #NotAtASCA and the year. This year we will be using #NotAtASCA15 to categorize posts made by people who aren't attending the ASCA Conference in person, but want to chat about it. New to Twitter? No Problem! Dr. Erin Mason, tech savvy counselor educator and Twitter Queen, has created a Twitter One-Tool-At-A-Time session that walks you through everything you need to know about getting started with using Twitter. I included the video below or you can view it here. For even more information about Twitter, you can check out the handout from the session Dr. Mason and I presented at #ASCA14, Professional Development in 140 Characters or Less. 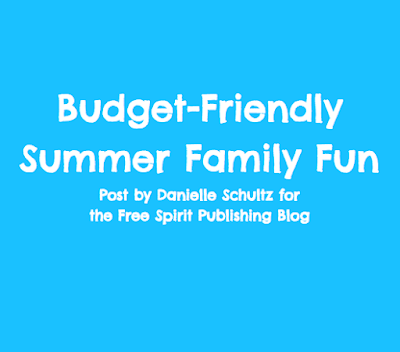 If you are a seasoned Twitter user, (or a newbie who wants to throw yourself into the action!) you can set up feeds on a Twitter management site such as TweetDeck or HootSuite. 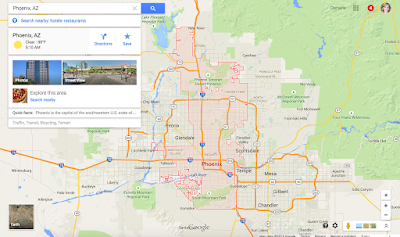 You can search for hashtags and create columns to follow. See below for an example of my feeds I set up for #ASCA15 and #NotAtASCA15. Once you set up the feeds, they will continue to add all the new tweets with those hashtags. When I was introduced to TweetDeck by Julia Taylor wayyyy back in 2011 it completely changed my world and made Twitter make so much more sense to me! Using a Twitter management system allows you to weed out all the random stuff and only view what you are interested in seeing. 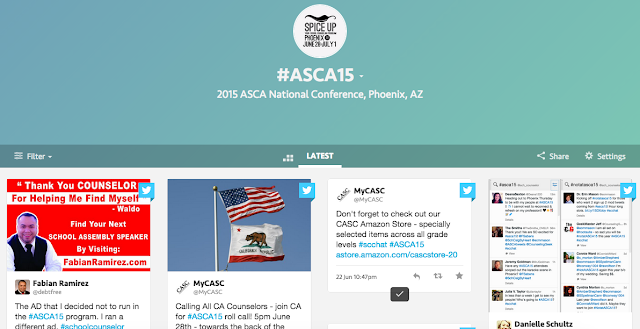 If you are not ready to take the Twitter leap yet, you can still follow the #ASCA15 hashtag without a Twitter account. Check out Tagboard, a website that allows you to search for a hashtag across multiple social media sites and follow the conversations. 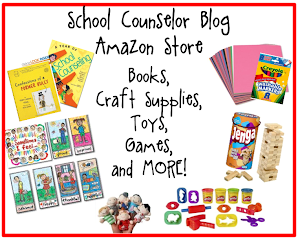 I wrote a previous post about using Tagboard for school counseling inspiration. I created a Tagboard that you can view all the social media with the hashtag #ASCA15 here. Once you find information and resources that you want to keep, you can create a document or use a service like Storify to save your favorite Tweets containing links and resources. 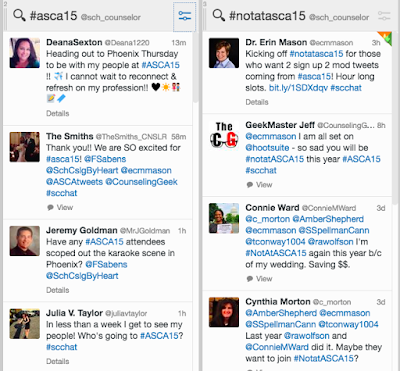 Participate in the #NotAtASCA15 Chat! 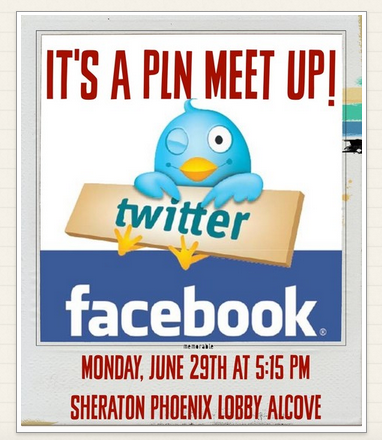 While our colleagues are meeting up in person School Counselor PLN Meet Up, those of us who are #NotAtASCA15 will be meeting up virtually at 8pmEST to chat about the #ASCA15 Conference and share what we learned so far from following along online. 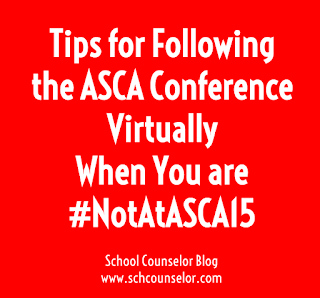 Dr. Erin Mason (@ecmmason) and I (@sch_counselor) will be moderating the #NotAtASCA15 chat. You can view a transcript of the #NotAtASCA14 chat from last year that was moderated by Connie Ward (@ConnieMWard). There are lots of great links and resources shared during the #NotAtASCA14 chat! If you want to view full sessions and presentations, ASCA has an option to attend the conference virtually for a fee. Virtual attendees are able to have access to all three keynote speakers, specific breakout sessions, and exclusive lunchtime interviews for a registration fee of $199 for ASCA members and $299 for non-members. 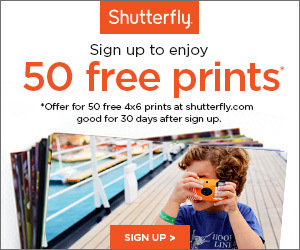 There is also an option to register for a single day for $99. 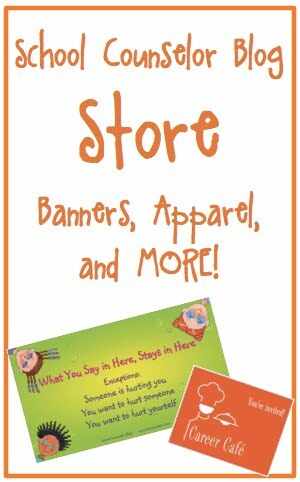 For more details, visit the ASCA website. Although this will be my first time following along with the ASCA Conference from home, I can imagine that the flurry of information will be a little overwhelming. Stay tuned after the conference is over because many bloggers will share re-caps of the conference and even school counselors #NotAtASCA will share information that they learned by following from home! 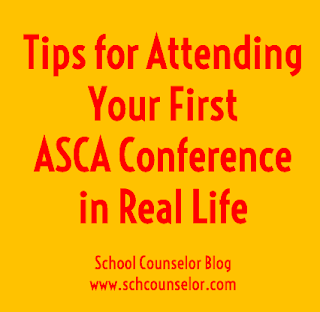 What tips do you have for virtually following the ASCA Conference? Attending #ASCA15 in real life (IRL), check out my previous post for tips on attending!